Profore LF Latex Free Compression Dressing Bandage from HealthyKin.com is a latex-free formulation, multi-layer compression bandage system. It has been developed in response to a growing concern from customers about the potential danger of latex allergy / hypersensitivity. 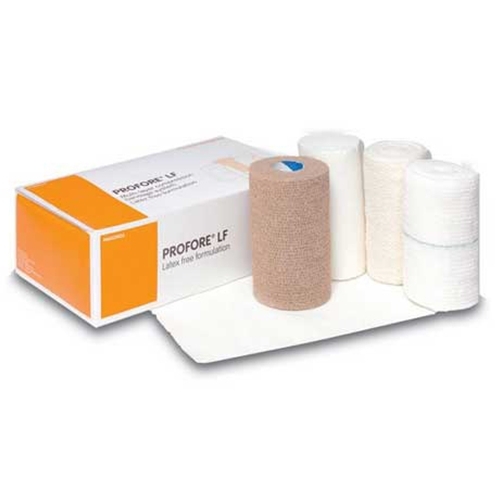 Profore LF provides the same effective compression and sustained results as the standard Profore Multi-layer Compression Bandage System, but its latex-free formulation allows the healthcare provider to use it with confidence on allergy-sensitive patients. Profore LF is best used on ankle circumferences greater than 18 cm or 7¼ inches (padded). The product was great, but the shipping was a little expensive compared to McKesson. I really like this product and the price is the best I have found. I found the product to be as advertised and to work extremely well. Have odered more than once and found the delivery cost reasonable and fast. Great product. Really does the job. Also, the best price and found, and with a number of warehouses around the country, I received my order in two days. These compression wraps work very well in keeping my "Staph Infection." With extreme swelling in check! !